Santa Fe, NM, September 8, 2010 – Jenny Sanborn and Issa Nyaphaga have just returned from a six-week trip to Cameroon, where their Mobility Campaign delivered wheelchairs and medical help. Sanborn, a volunteer with Soulful Presence, a Santa Fe-based nonprofit organization, and Nyaphaga, the founder of Hope International for Tikar People (HITIP), were part of a cooperative effort delivering free medical equipment, as well as no-cost medical consultations and surgeries to improve life for Tikar people with disabilities. The donation of equipment was made possible in large part by support from the community of Santa Fe. 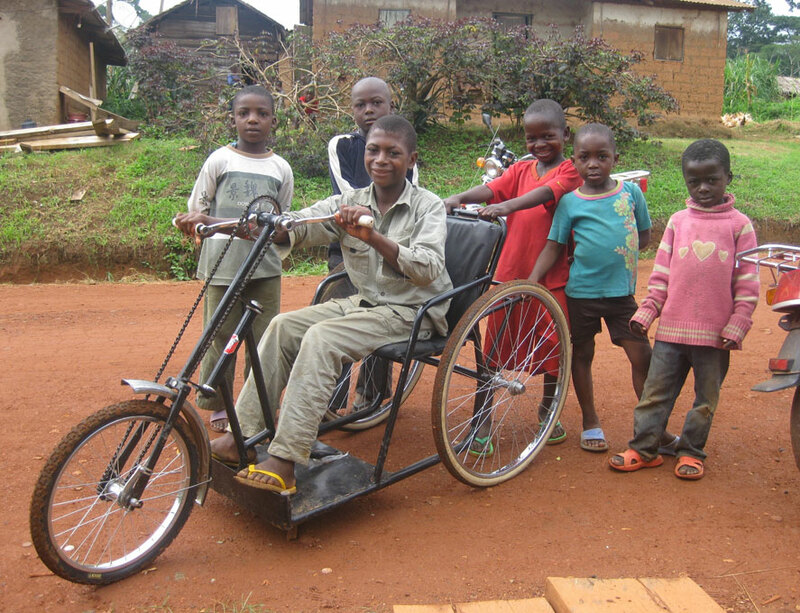 On this, their second joint trip to Nditam village, they were able to provide wheelchairs, some Cameroonian-produced three-wheelers, designed to help villagers travel long distances over dirt roads and rough terrain. They also delivered standard wheelchairs, crutches and canes. Their partnership with Dr. Georges Bwelle, a Cameroonian surgeon, meant that with his Mobile Clinic team of 35 volunteers from the US, France, Belgium, Germany and Cameroon, they were able to provide 415 medical consultations, medication for 900 people and 21 surgeries. Sanborn and Nyaphaga were able to deliver help to recipients who had been identified during their trip last year. Needs assessment is an ongoing process, where people are identified during one trip and then medical help and equipment suited to their needs is delivered the next. “We bring global ideas and a global approach to this work,” Nyaphaga says. 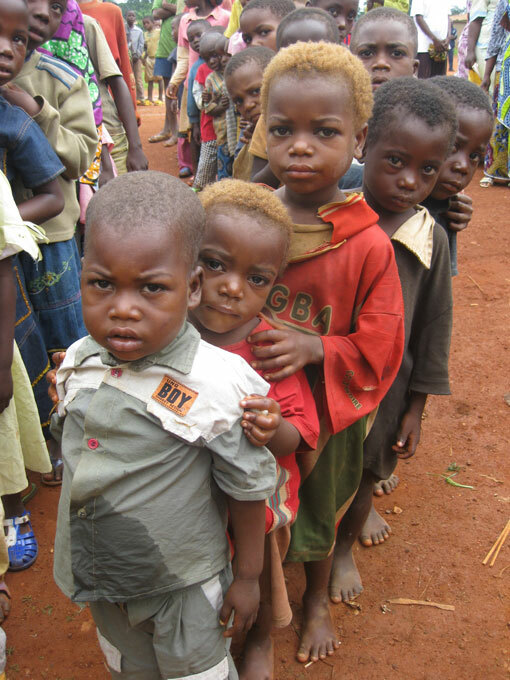 A network of support, with Soulful Presence and HITIP reaching out to partners inside and outside Cameroon, has been able to provide far more than the two groups could on their own. During this summer's campaign, a little girl who had been very badly burned was able to receive surgery which was funded in part by the Rotary Club in France after they heard about the case through surgeon Bwelle. 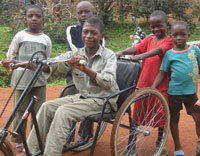 A boy who was using rickety wooden crutches received a new three-wheel wheelchair. “He waited nine months but we saw him just blossom once he sat in his chair,” Sanborn says. With the broader network of collaborators, other projects in Nditam have begun. A Swiss resident of Cameroon, Michel Pauli, brought in lightweight, flexible solar panels which powered lights that were critical for performing night surgery during the Mobile Clinic, and that also provide power for the school's new low-power computers. The first recipient of a three-wheel wheelchair, Ibrahim, has become a self-taught electrician. He will now receive training at the technology school run by Pauli in another town, and return to the village with technical skills. This will allow him to take a leadership role in sustaining the computer and solar technology for Nditam. Efforts will continue while Sanborn and Nyaphaga are gone. Now that relationships have been established between the village and surgeon Bwelle and computer expert Pauli, they can return and do further work this fall. “We can't always be there, but the relationships on the ground are ongoing,” Sanborn says. “Soulful Presence and HITIP are the bridge, the link that helps that happen,” adds Nyaphaga. Jenny Sanborn and Issa Nyaphaga are available for interviews.